This time we're playing with Fire. Or should I say for Fire. A Kindle Fire - one of this year's hottest gifts valued at $199 - sponsored by New York wine retailer Grapes the Wine Company (mystery shopper store review). The Spectator unveiling begins Monday November 14th so we'll run our contest starting Friday, November 4th 2011 at 9:00 am Eastern. Guesses are submitted as comments on a follow-on blog post that will be published Friday morning. Don't leave your guesses here - wait until Friday morning and leave it as a comment on this blog post. The first person to guess a specific wine "owns" that wine as their entry. Subsequent guesses of the same wine aren't useful so look at the previous comments before submitting your entry. 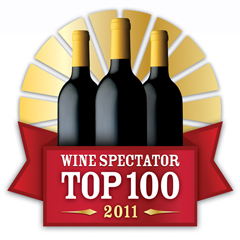 If nobody guesses the Wine of Year, the guess with the highest position on the list will win the prize. Since the Kindle Fire is US-only at this point, a winning entry from outside the U.S. will receive a $199 Amazon.com gift card. As you'll recall last year we played for a $75 gift certificate. This year we're playing for a Kindle Fire so I expect the competition to be more fierce. Until then, hop on over to Grapes the Wine Company's website and sign up for their newsletter. If you like wine deals like I do you won't be disappointed. My thanks to Daniel Posner for this sponsorship. See you back here Friday morning!